Visual Manna's Art Adventures in Narnia offers a variety of creative projects related to the Chronicles of Narnia. Over 56 pages feature paint, clay, and craft projects related to lions, weapons, dragons, maps, and other Narnia-related topics. Art lessons on perspective, shading, using a grid, scale, and positive and negative space are also integrated throughout. Topical lessons feature a variety of content and include a range of creative ideas and suggestions; some will appeal more to older or younger students. Only basic art materials such as pencils, drawing paper, construction paper, glue, yarn, markers, crayons, etc. are required. This CD-ROM contains the PDF text of both Volume 1 and Volume 2; great for easy printing. Grades 3-8. 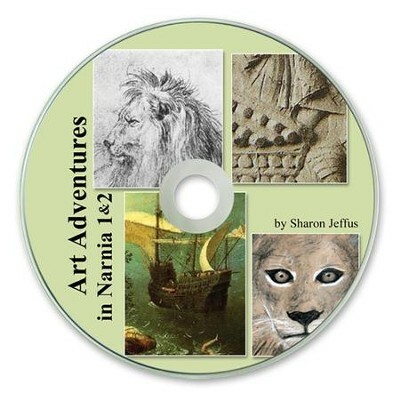 I'm the author/artist and I want to review Art Adventures in Narnia 1 & 2 PDF CD-ROM.